Needless to say, only three things can happen between now and election day. McCain starts to close the polls to make it close. Things stay about where they are now. Obama regains more momentum and turns the election into a blowout. Hard to tell which way things might be going. 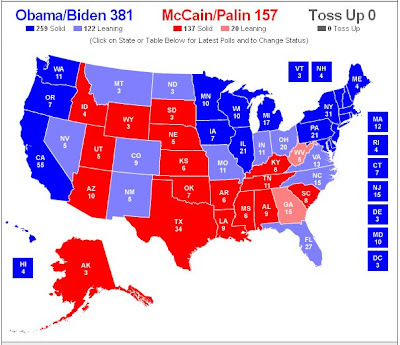 But with Nate Silver suggesting Obama doing just fine now in Ohio and Florida and even winning Montana, I may have been wrong a couple of days ago: we may be looking at a map like this on election day.